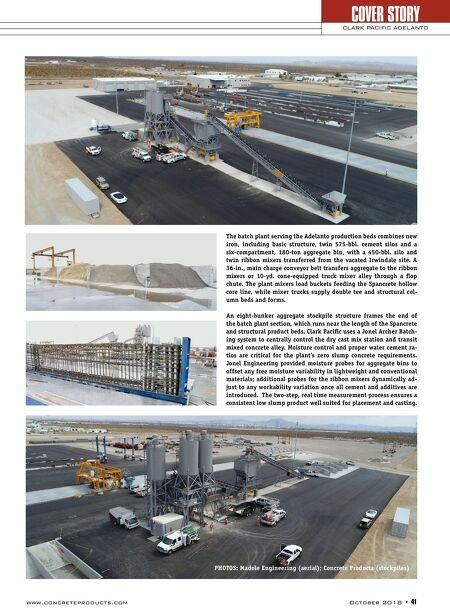 www.concreteproducts.com October 2018 • 41 COVER STORY CLARK PACIFIC ADELANTO PHOTOS: Madole Engineering (aerial); Concrete Products (stockpiles) The batch plant serving the Adelanto production beds combines new iron, including basic structure, twin 575-bbl. cement silos and a six-compartment, 180-ton aggregate bin, with a 450-bbl. silo and twin ribbon mixers transferred from the vacated Irwindale site. A 36-in., main charge conveyor belt transfers aggregate to the ribbon mixers or 10-yd. cone-equipped truck mixer alley through a flop chute. The plant mixers load buckets feeding the Spancrete hollow core line, while mixer trucks supply double tee and structural col- umn beds and forms. An eight-bunker aggregate stockpile structure frames the end of the batch plant section, which runs near the length of the Spancrete and structural product beds. Clark Pacific uses a Jonel Archer Batch- ing system to centrally control the dry cast mix station and transit mixed concrete alley. 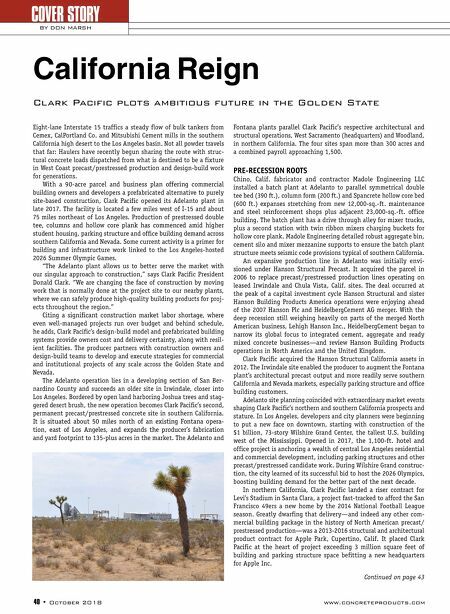 Moisture control and proper water cement ra- tios are critical for the plant's zero slump concrete requirements. Jonel Engineering provided moisture probes for aggregate bins to offset any free moisture variability in lightweight and conventional materials; additional probes for the ribbon mixers dynamically ad- just to any workability variation once all cement and additives are introduced. The two-step, real time measurement process ensures a consistent low slump product well suited for placement and casting.